The firefighters were working to extinguish smaller fires in the southern part of the country as the major blazes were under control Friday. 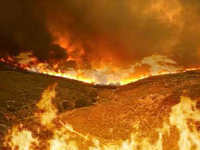 One week after hundreds of wildfires broke out across Greece, killing 64 people and costing the country at least EUR1.2 billion (US$1.6 billion), the fire department said the last major fire near the town of Kato Kotyli, in the southern Peloponnese peninsula, "no longer has an active front and is receding." But it warned in an announcement that, just because "we are in a phase where fires are receding, that does not mean that the danger has been eliminated." Initial government estimates indicate at least 1,500 homes were gutted in the southern Peloponnese peninsula and on the island of Evia, just north of Athens. But there are concerns that figure could double. At least 4,000 people were left homeless, but that number also could double. Prime Minister Costas Karamanlis, who faces a close race for re-election in less than three weeks, promised to rebuild all homes destroyed by the fires through a new disaster relief fund made up of state and private contributions. He said homeless families would initially be provided with prefabricated homes. Karamanlis did not say how much that would cost. Finance Minister George Alogoskoufis said half the afflicted areas' agricultural infrastructure had been wiped out. Before the fires, it had accounted for 12 percent of the country's total. But Alogoskoufis said the impact on the overall economy would be small. The affected regions contribute a total of 4.5 percent of the country's gross domestic product, he said. The Finance Ministry put the preliminary cost of the destruction so far at a minimum of 0.6 percent of GDP, or EUR1.2 billion (US$1.6 billion). The European Commissioner for Regional Policy, Danuta Hubner, was expected to tour the burned regions Friday to asses how much aid Greece needed. Thousands of people again lined up outside banks for a third day Friday to receive emergency aid, and the government said 20,000 people received a total EUR72 million (US$98 million) since banks started to hand out the funds on Wednesday. But officials said they would tighten checks on the fast-track aid process after at least 15 people from other parts of the country were arrested in the southwestern city of Pyrgos for allegedly making false claims. A help line set up for fire victims and offers of help has received tens of thousands of calls so far, mostly from people who want to contribute aid. Government spokesman Theodoros Roussopoulos said private donations from Greeks has amounted to more than EUR38 million (US$52 million). The government has so far budgeted about EUR300 million (around US$450 million) for such aid. The fires are dominating political debate before the Sept. 16 elections. Criticism that the government failed to respond quickly enough - and its suggestions the fires resulted from an organized attack - could hurt Karamanlis. A series of polls have indicated that the conservatives had a razor-thin margin over George Papandreou's main opposition Socialist Party.